The worst power disruption in the country in recent decades will cost the Government an estimated Rs. 600 million or Rs. 200 million an hour, according to reports reaching Prime Minister Ranil Wickremesinghe. Thursday’s countrywide blackout also caused severe damage to the Norochcholai Lakvijaya power plant preventing it from supplementing power demand during peak hours to meet the shortfall from the national grid. As a result, since Friday, the Ceylon Electricity Board (CEB) has been compelled to resort to unannounced power cuts in outer areas and it has appealed to consumers in metropolitan Colombo to cut down on the use of electrical appliances. Power is yet to be restored to some outer areas. The Public Utilities Commission of Sri Lanka (PCUSL), a statutory body, has asked the CEB for its power cut schedule to keep consumers informed. However, the PCUSL has been told that there were no such cuts. More details of how the country was without electricity for three hours appear elsewhere in this newspaper. Premier Wickremesinghe, who is making a personal study of the adverse impact of the blackout, is to appoint a high powered Committee to probe the matter. It will also ascertain why existing mechanisms to cope with lightning after it occurs were not utilised and whether there was any attempted sabotage. The composition of the committee is now being worked out and will be announced in the coming week. The Government’s concerns have been heightened by fears that new development plans now approved or in the pipeline would be hampered by a repeat of such occurrences. Already the ‘power shedding’ for as much as six hours a day is causing serious concern. “We found that the Ceylon Electricity Board (CEB)’s future projections were completely off the mark. Even before the blackout, the Power Consultation Committee of the Cabinet Committee on Economic Affairs was discussing this matter. 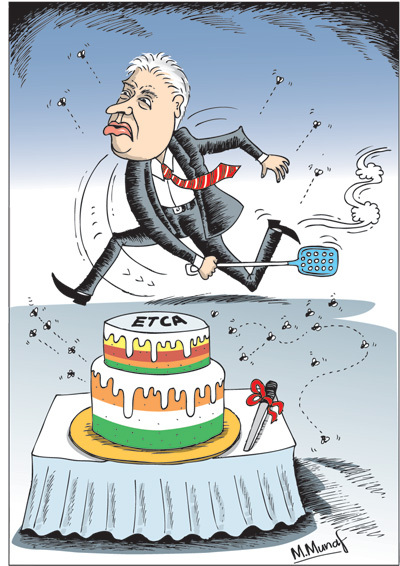 This was after the CEB had placed its projections,” Premier Wickremesinghe told the Sunday Times. Hectic worldwide inquiries are being made to obtain help to prevent any further blackouts and ensure a stable supply until projects are evolved to increase supply. A Government source said the present situation in the electricity sector could not go unchecked. He said that the hydro storage capacity was 1100 gigawatt hours. It was now 700 hours and power cuts would become inevitable if it fell to the 300 hour mark, he warned. It was imperative, the source argued, that the existing supply and distribution systems are not disrupted whilst the Government plans to expand power production. Yoshitha Rajapaksa being brought to the Kaduwala courts on Thursday: Former President Mahinda Rajapaksa and wife were at the premises with a few supporters – much less than the number that turned up on an earlier occasion. The blackout on Thursday came as perceived threats on the Government from different quarters in the Opposition began to somewhat recede. One was the demand by the “joint opposition” to be recognised as the main Opposition in Parliament. The group, of which Mahajana Eksath Peramuna (MEP) leader Dinesh Gunawardena is head, claims it has 51 MPs including those backing former President Mahinda Rajapaksa. Speaker Karu Jayasuriya who this week made clear he had no authority to recognise the group as the main Opposition in Parliament, however, granted other privileges to this group. It came after Jayasuriya had consulted both President Sirisena and Prime Minister Ranil Wickremesinghe. Such privileges, Jayasuriya told the Sunday Times, included allocation of time for its members — almost 55 per cent — to raise questions at adjournment as well as being made members of parliamentary committees including COPE and the Public Accounts Committee. He said there were 40 members in this group. In essence, the move shuts the door on Rajapaksa becoming the leader of the “joint opposition” in Parliament. Since the group made the demand to be the main Opposition, Government leaders were suspicious that the move may be a ploy to ensconce Rajapaksa as leader of the “joint opposition.” That is not to say relations between the “joint opposition” and the pro-Maithripala Sirisena members of the Sri Lanka Freedom Party (SLFP) were on the mend. SLFP General Secretary Duminda Dissanayake sent out a letter of warning to MPs. He conveyed the party’s Central Committee decision that no member of the party should help or contribute in any way for the formation a group or work against the interests of the party. However, that has also not deterred the “joint opposition” members from joining their SLFP counterparts (in the UPFA) to seek a common stand on the proposed new Constitution. A group led by Dinesh Gunawardena has been meeting an SLFP team including Ministers John Seneviratne, Anura Priyadarshana Yapa, Susil Premajayantha and Faiszer Mustapha to discuss matters relating to the Constitution. This is how amendments to the original resolution moved by Prime Minister Wickremesinghe were formulated. The SLFP amendments have now been incorporated into the one issued on December 21 last year and moved in Parliament by the Premier and seven other ministers. It will go before the Cabinet of Ministers for approval next week. Ahead of that, the SLFP Central Committee will examine it. A vote on the resolution will be taken in Parliament on March 9. Premier Wickremesinghe’s resolution already tabled in the House had 39 clauses. The SLFP document contains only 32. From here too, a pruned down final version may end up with some 24 clauses, according to government sources. Most of the deletions relate to detailed procedures with regard to the work of the Constitutional Assembly. Premier Wickremesinghe reiterated that with the passage of the resolution, Steering Committees would be appointed. It is these Committees that will receive reports from different Sub Committees, and later submit a final report and a draft resolution on the draft Constitution. The privileges offered to the “joint opposition” have ensured that its members are taking part in the process to formulate a new Constitution. For the pro- Rajapaksa faction, the situation appears somewhat different. Their leader made all plans to form a new political party and launch a membership drive in the wake of what he believed was impending local council elections. However, such elections are now not forthcoming, not until next year. Even Local Government and Provincial Councils Minister Faiszer Mustapha who just a week ago announced such polls would be held in June has now backtracked. He is now saying that polls will not be held until delimitation work now under way to re-define wards is completed. But he did not give a time. It was clear from the beginning that the Sirisena-led SLFP wanted the elections delayed until it was able to get its act together vis-à-vis the party dissidents who were with Rajapaksa. As a result, Rajapaksa who opened a political office at Jayanthipura in Battaramulla as a prelude to launching a new political party, has put matters on hold. One issue that is facing the proposed new party is who should be its leader. Suggestions that the leader should be a member of the Rajapaksa family have not met with approval of close supporters. On the other hand, Rajapaksa, who wants to remain the de-facto leader is not in favour of the leadership going to any ‘outsider.’ Be that as it may, a build-up of political activity with no local polls in sight would only dissipate the pro-Rajapaksa group resources and drive away its supporters. The question of supporters has become a critical issue. 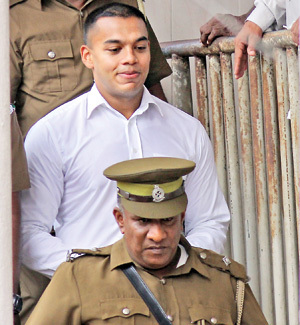 If there were crowds around Rajapaksa and his family members in the Kaduwela Magistrate’s Court on past two occasions when his son Yoshita was remanded, numbers have dwindled since. When Yoshitha Rajapaksa, accused of money laundering, was brought to Court by Prison guards, this week there were only a small group of MPs present. The fact that more members of the family and even aides are facing investigation or arrest has added to this situation. On Friday, Police Special Task Force (STF) commandos assisted detectives of the Criminal Investigation Department (CID) to dig a three and half acre land belonging to Major Neville Wanniarachchi. He has been attached to Rajapaksa’s personal security detail. The search was conducted after a tip off that weapons and large quantities of jewellery were hidden underground at this land in Weeraketiya. It drew a blank. Major Neville has been assigned to Rajapakasa and is also the subject of investigations by the Commission to Probe Allegations of Bribery or Corruption (CIABOC). He has been questioned by CIABOC officials over the reported possession of fuel stations, property and the sale of a permit to generate wind power in Puttalam. He has served Rajapaksa’s security contingent from the rank of a Sergeant in the Army. CID detectives were busy yesterday making arrangements for the arrest of persons linked to the alleged murder of Wasim Thajudeen, a former national rugger player. This was after Colombo’s Additional Magistrate Nishantha Peiris declared on Thursday that the ruggerite’s death appeared to be a murder. In what seems to be one of the tough cases for them, CID detectives made breakthroughs with foreign help. One instance was with the help of British experts who came to Sri Lanka to retrieve phone call records from a mobile operator. They have been able to obtain more than two vital conversations linking one of those who was allegedly involved and a young politician. In these conversations, matters relating to the incident had been discussed. Among those likely to be arrested are a politician, personnel of the notorious Presidential Security Division (PSD), a onetime powerful Police officer, Army security personnel once attached to Rajapaksa and a young politician. Highly placed Police sources said yesterday that there was evidence to confirm that Thajudeen was badly tortured the day before it was claimed that he reportedly died in an accident. As the new political developments play out, it is becoming increasingly clear that former President Mahinda Rajapaksa has painted himself into a corner. Plans for him to play a key role through the new “joint opposition”, his proposed new party and a campaign have been put on hold. Local elections where he and his group wanted to make a mark have been put off on the grounds of problems relating to the drawing up of new local council wards. Rajapaksa’s immediate and extended families are under investigations with possibilities of custodial sentences (prison terms). His associates are being questioned for various indiscretions during the tenure of the previous administration. The push for control of the Opposition benches of Parliament by the pro-Rajapaksa faction in the UPFA has been stalled. For President Sirisena, the leader of the (SLFP), straining as he is to consolidate his leadership in his party, he has manage to arrest the haemorrhaging of the party, check the Rajapaksa cavalcade for now giving him more of a chance to ensconce himself in the saddle of the SLFP.